Each year eTextile Spring Break has an exhibit showing participant’s work. The exhibit has a couple of different purposes. One, it’s meant for participants to show and share work with each other, and two it’s for sharing with the public during our community day at the end of the week. The work that participants bring can be a work in progress, an utter failure, or a complete piece. The exhibit also provides an opportunity for participants to display what they have worked on during the week of Spring Break. This piece is a step of research for Ovaom, a French enterprise that wants to awaken children to sound exploration and open up their musical imagination. 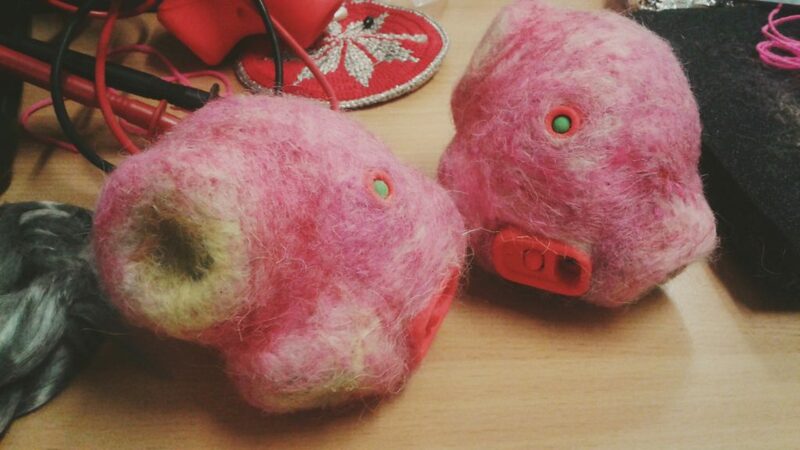 The Ocarina is a 3D printed object and a felted cover with capacitive sensors integrated. An augmented reality textile exploring the 1919 Eddington Expedition. Experiments created during explorations with weaving and technology. Embodied RF Ecologies by Afroditi Psarra. Following my quest to embody the invisible transmissions that surround us, in this wearable I explore the use of an IC mixer circuit to down convert the emissions from the NOAA weather satellite and make them audible. 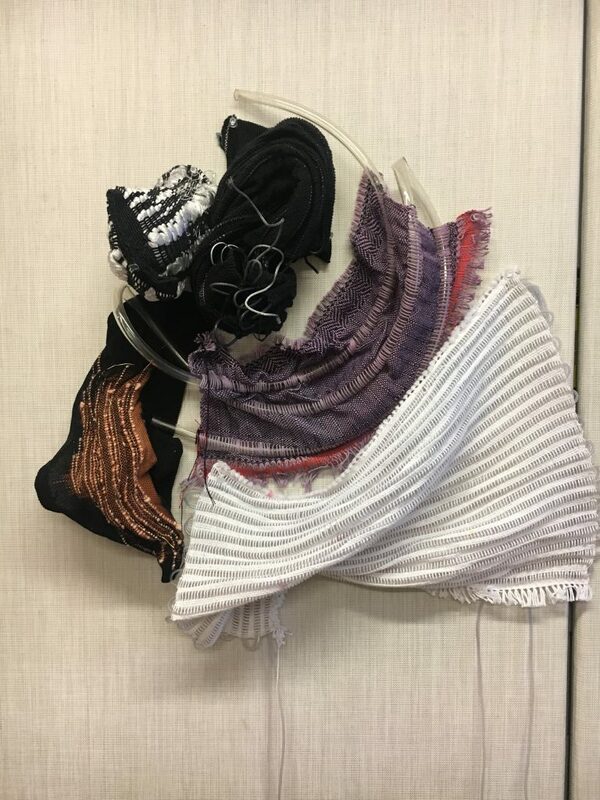 By continuing my research into textile antennas and fractal geometry as a means to detect radio-frequency (RF) transmissions, I aim to speculate about the body as an agent of power in a post-capitalist world and to re-interpret transmission technologies through handmade crafting techniques. Yucatecan Electric by Emilia Pucci and Theda, Cooperativa Flor de Margarita. 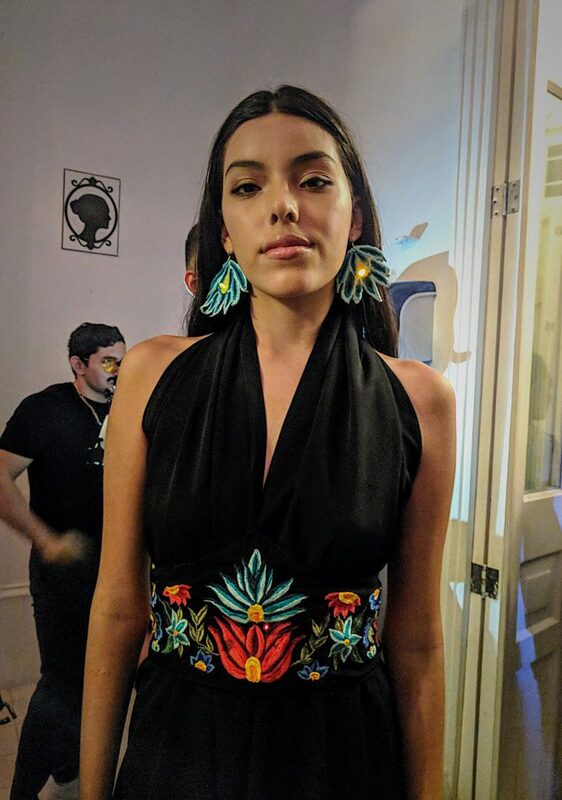 Collaboration between Theda, a contemporary fashion brand with Mayan designs, Cooperativa Flor de Margarita, a Mayan cooperative of textile embroiderers and myself. 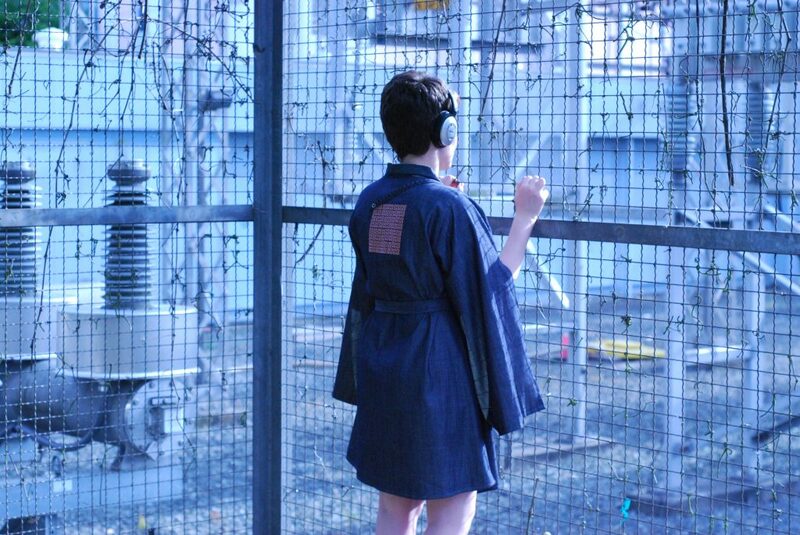 The aim of the project was to interchange knowledge between e-textiles and traditional embroidery. The result is a dress that illuminates with different light patterns depending on the speed at which the wearer walks, hinting to the many levels of speed to which innovation can go. The fastest is not necessarily the most interesting. Capturing postures and social behaviour with conventional techniques can be intrusive and restrictive. 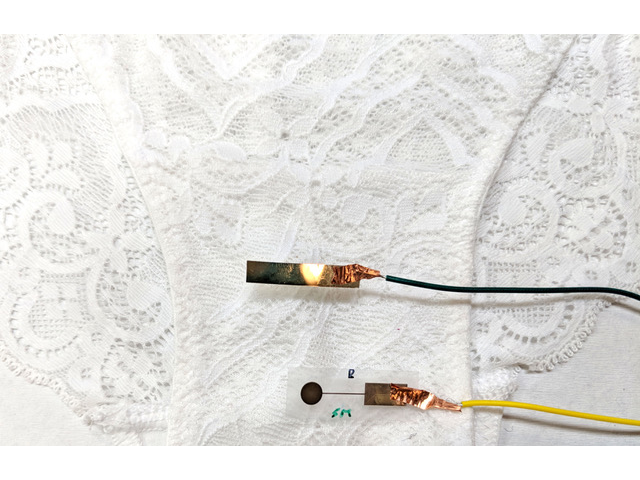 E-Textiles in clothing presents a new modality to sense body movement ubiquitously. 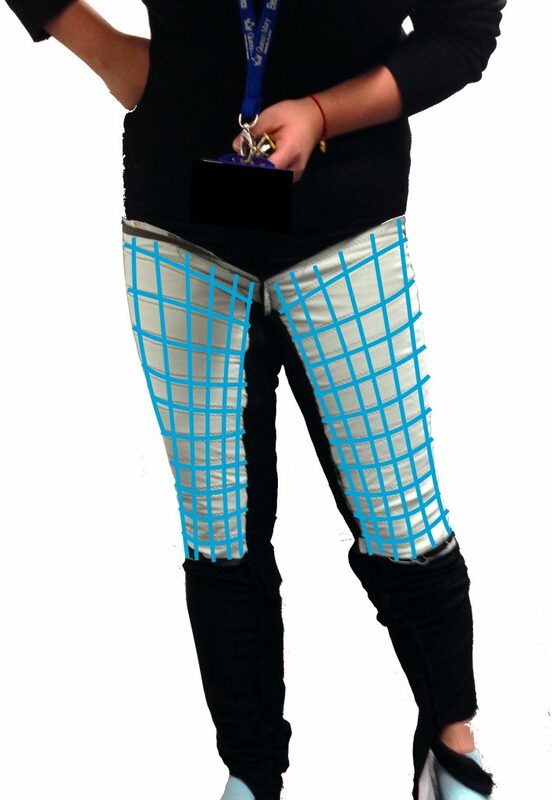 The ‘smart’ trousers presented here embed a fabric sensor matrix around the thighs and buttocks, and were tested to distinguish between speakers and listener behaviours from pressure data. A wearable biosensor designed for women to monitor vaginal fluids. Project documentation. Playground is an interactive sound art project, where giant textile balls make sound and music as they are played together. The project poses an artistic and technical challenge in instrument design, by endeavouring to craft a large and portable sound art piece, adaptable for many varied settings. 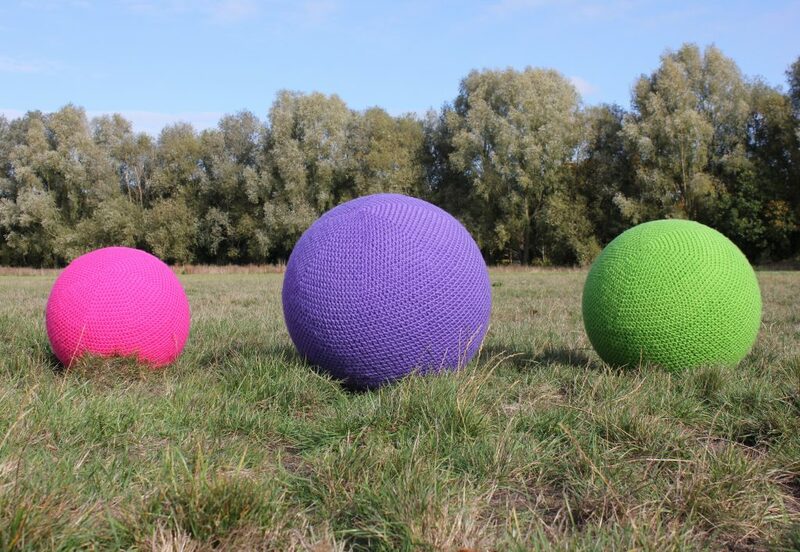 The balls seek to be expressive, curious, intuitive and engaging, with a wealth of interesting and dynamic musical material held within and to be explored through participant play. These social, playful and interactive objects seek to engage a broad audience in sonic art and explore a soft, playful and joyful approach to experimental new music. My Heart on My Dress is a bespoke connected garment that visualizes my daily experiences and emotions through dynamic changing colors and patterns. Real-time text analysis of my digital diary influences the design of the dress. CHRISTMAS MESSAGES DON’T ALWAYS NEED TO BE MONOTONOUS, AND LET’S SAY IT, NICE! Mr. Grinch offers a new possibility for those who don’t enjoy those feasts shared with relatives that you see once a year. BE HONEST, MERRY GRINCHMAS! The Merry Grinchmas sweater is an interactive garment that provides a wide range of personalized printed messages as a complaint whenever someone touches the Grinch’s hat pompon. Once touched, the system prints in real time one signed message. What if your quilt could speak? What stories would it share? What would it remember? What would it forget? What if the Quilt is the one telling your story instead of you? The Tell Tale Quilt imagines a future where the textiles knitted into our lives also have the ability to collect and share information about us. It shares intimate, but non-personally identifiable information about its owner with anyone who wants to listen. It shares memories of your data. Learn what a soft circuit is as you light up LEDs with a high-five and make noise by the bend of your elbow. 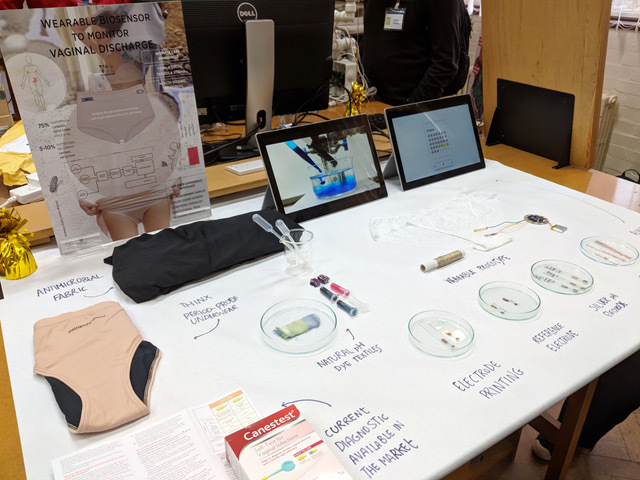 Choose from a collection of soft and flexible snap-together switches and sensors to discover what’s possible when electronics are made from fabric. Lara will also be showing some work from the FlexAbility project created in collaboration with Anna Blumenkranz and Adrian Freed. 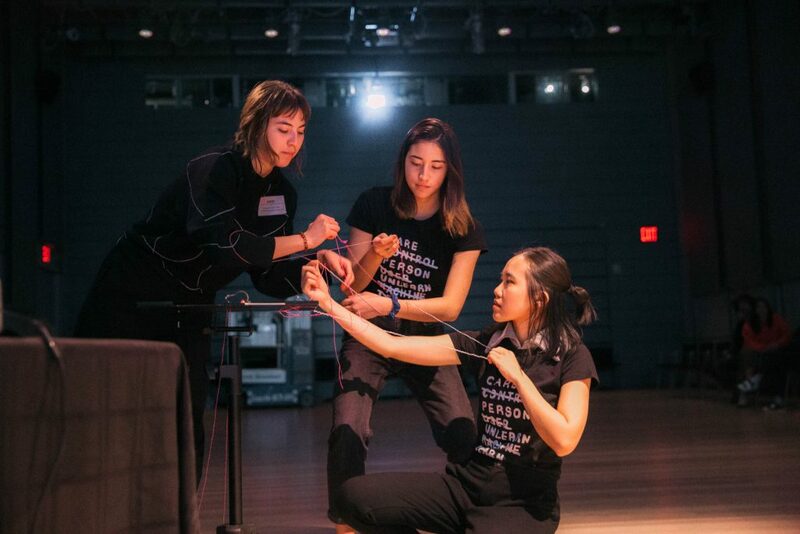 Documentations from Distributed Web of Care at the Whitney Museum on March 27, 2019. This lecture-performance by Taeyoon Choi imagines a more equitable, caring Internet and asks: what kind of network do we want for the future? Choi engages in a conversation with Chancey Fleet, Jonathan Dahan, and stewards and students from the School for Poetic Computation to explore the poetics and politics of computation, the relationship between Internet privacy and collective agency, and alternative methods of communicating via peer-to-peer protocols. The discussion considers the Internet’s underlying structure and how bodily experiences of the Internet differ for disability communities and other marginalized groups. The conversation is followed by an interactive performance choreographed by Choi and Jerron Herman, accompanied by live audio from Tiri Kananuruk and stud1nt. The movements explore how it feels to be a node programmed in centralized, decentralized, and distributed networks. 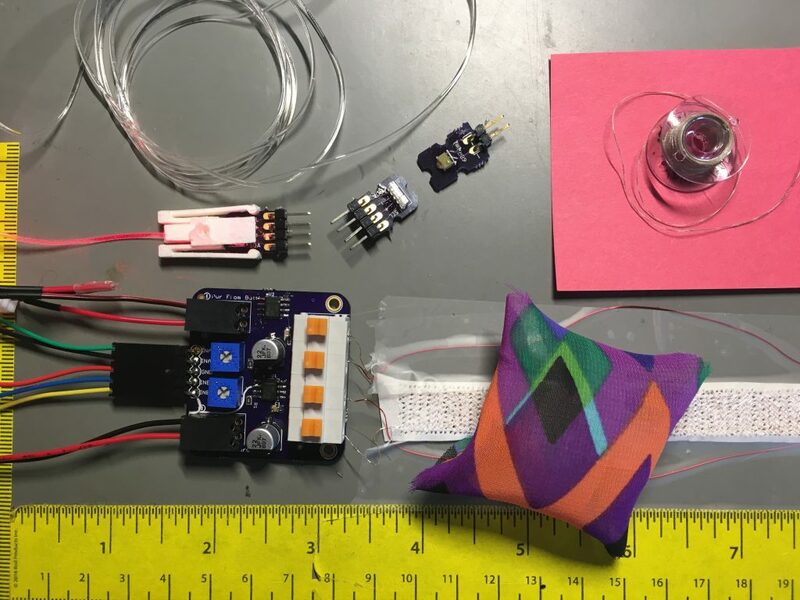 Components for soft and wearable electronics: An optical stretch sensor, a soft electromagnetic linear actuator, and a striped thread for stitching e-textiles without shorting. Zeroes and Ones began as an exploration into the relationship between the construction of cloth and composition of music. The project originated in MaxMSP, where I created a series of pixelated drawings that I then hand wove on a Thread Controller jacquard loom. 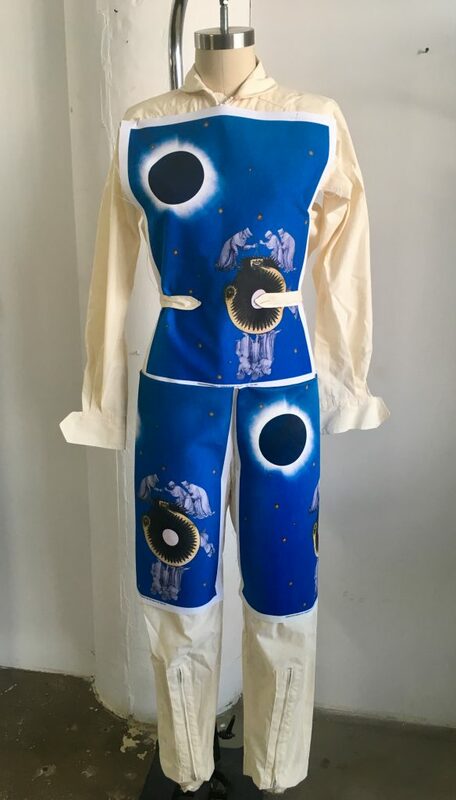 For this iteration of the project, I have been creating garments for performers featuring fabric with the same imagery that is read by the app. As the dancer moves, the images are distorted and changes the way they are read by the app. Research about how to convert light path of laser projection to a printed garment in large scale. This version is made for Design Shanghai in Shanghai, an international leading design event in Asia. 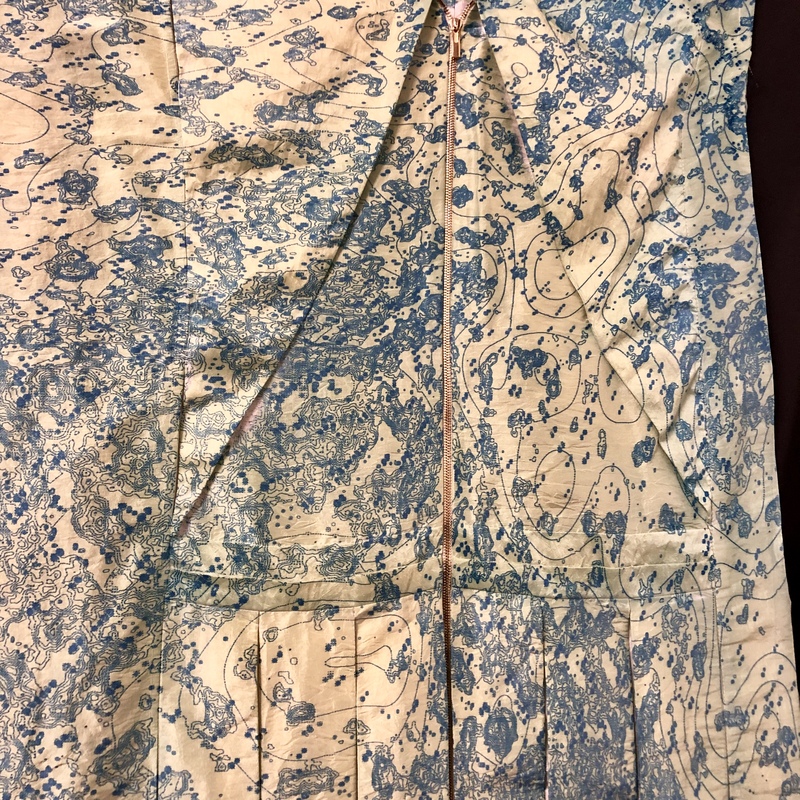 This 110*110 cm folded square piece is meant to fit into the laser projection range in order to get light exposure it can then be unfolded into dress form. A work-in-progress: weaving push buttons for soft circuits on different looms, based on a design where conductive yarn is along both warp and weft directions. After I wove a single button for prototyping using a pin loom, I made a sampler file for a TC2 digital jacquard loom for a button matrix using supplementary warp for the vertical conductive components. 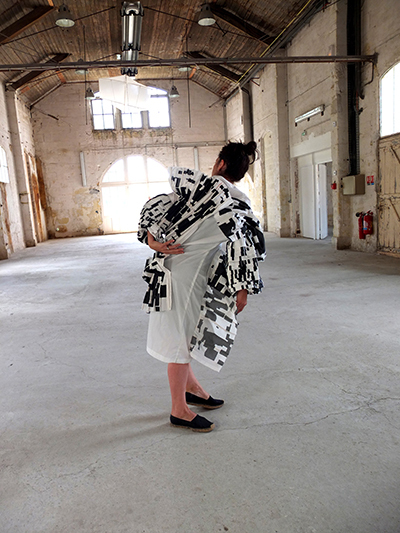 The Material Library is a catalogue of physical swatches developed by Fab Textiles at Fab Lab Barcelona by various students, interns, researchers and faculty. The library is accompanied by the publication of digital open source booklets that document the step by step process and tools needed for the creation of each biomaterial. The objective is to engage and invite individuals to create their own materials and understand the resources and energy required as well as their life cycle. The materials one can find in this library are all biodegradable non-waterproof and not certified. Textile dyeing chemical processes contribute significantly to pollution and results in waste products that find their way into our rivers and oceans. 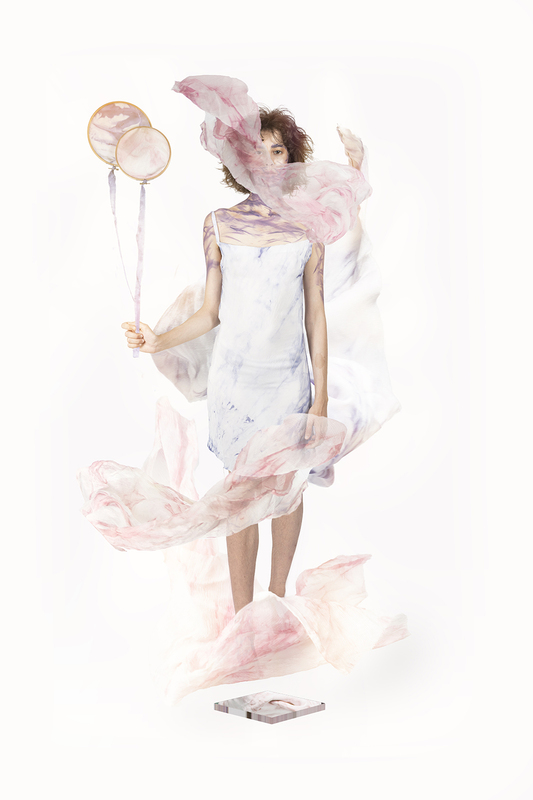 Could dyeing with bacteria be an alternative to chemical dyes? With BioShades we explore the potential of dying with bacteria as a less harmful alternative to the environment. 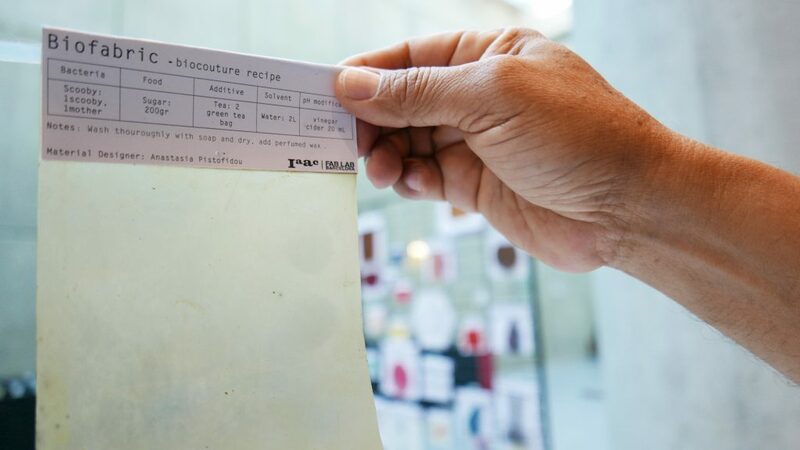 BioShades is a knowledge-based project transferred to various labs by Waag Textile Lab Amsterdam part of TCBL that aims to renew the European Textile & Clothing sector.